I love going on holidays. I am always planning the next trip. To me, it doesn’t matter if it’s a lengthy overseas stay or a weekend away, I get ridiculously excited. It’s a break from the every day. And best of all I get to see how other people live! There’s something intoxicating about that (for me, my husband just thinks I’m weird!). I love going to shopping centres, discovering new stores and even going into the supermarket to see foods we don’t have back home. At the Ala Moana Shopping Centre in Honolulu the boys discovered the Lego store, my daughter fell in love with Hot Topic and I found Williams-Sonoma. Every time I use the things I bought in that store, I am flooded with happy memories of our holiday. Recently I was looking for cooking schools in Sydney when I read that Williams-Sonoma had not only opened their first store outside the US in Bondi, but also their first ever cooking school was there as well! A couple of days later my friend and I drove across the Harbour Bridge to Bondi and I was shopping in one of my happy places. I fell in love with this dish, as soon as I came home I washed it and started making this week’s French Fridays with Dorie recipe. My son came home from an excursion to China Town where he used the money I gave him for lunch to buy a remote control car and helicopter. It was raining outside so I had two 13 year olds and two 5 year olds racing cars and helicopters indoors and it was cool because I had a pretty dish that made me smile! I preferred eating it cold the next day. I didn’t think it was anything special to be honest, but I am glad I made it. I’m looking forward to reading what the rest of the French Fridays with Dorie group thought and the ingredients they added to their bread! 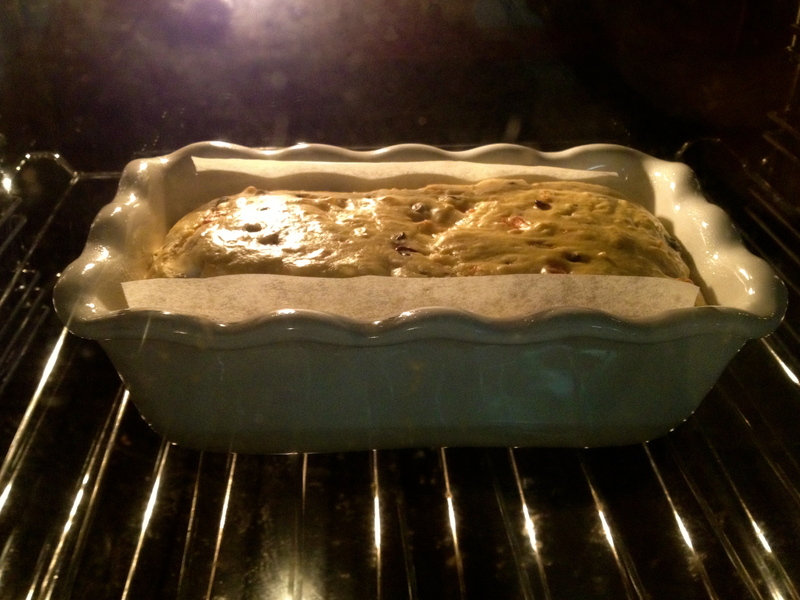 Tags: baking, bread, cheese, cooking, food, french fridays with dorie, olives | Permalink. I LOVE your new loaf pan! My bread was awfully salty…kind of agree with your review. It sure smelled wonderful, though. I LOVE Williams-Sonoma. You loaf pan is very pretty. It would make me smile too. I added sundried tomatoes and used feta cheese for a Greek twist. It was good. Have a great weekend. I remember discovering WS in Wash DC for the first time. Now, every time I go, I come back with a full suitcase of kitchen stuff! Addicitive. I wish I could get a ceramic pan like yours here, its´s so gorgeous! This recipe was very good, but I prefer the savory cheese chive bread better. I LOVE this statement and it could be my motto. In fact, your entire first paragraph could just as easily have been written by me. Fun post. William Sonoma is a much more wonderful store than this bread… yours did come out lovely. I used sundried tomatoes too! And I do love your loaf pan, if that’s what it’s called. 🙂 Lovely! The sundried tomato addition would have been nice. I really enjoyed this load. That’s a nice dish – I am keen to go to Williams Sonoma when I am next in Sydney. Your entire Post made me smile but the fact that your son used his lunch money for a remote control car and helicopter (I only deal with girls so I have no idea what that is) made me laugh-out-loud. I thought your buildup to the finale was going to be that you loved, adored, and relished the bread made in your new W-S loaf pan. Nooooo Sorry this wasn’t a favorite for you and your family but your new W-S prize is great. That’s a favorite store of mine also. Beautiful bread & lovely memories! 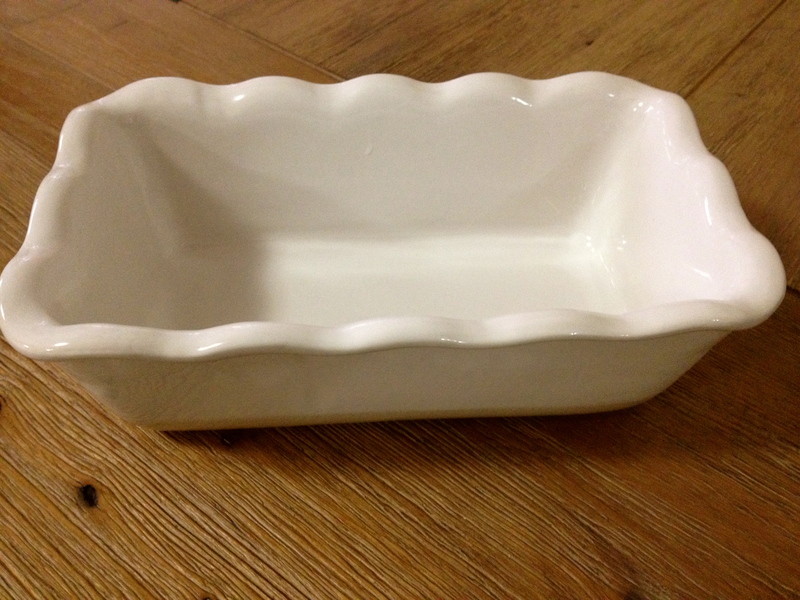 Such a very pretty baking dish – I love to visit the Williams Sonoma site (online) and every time I look at all these wonderful things that they sell, I get quite envious (in a really good way) but I also found some wonderful kitchenware stores in EU so, I cannot complain. 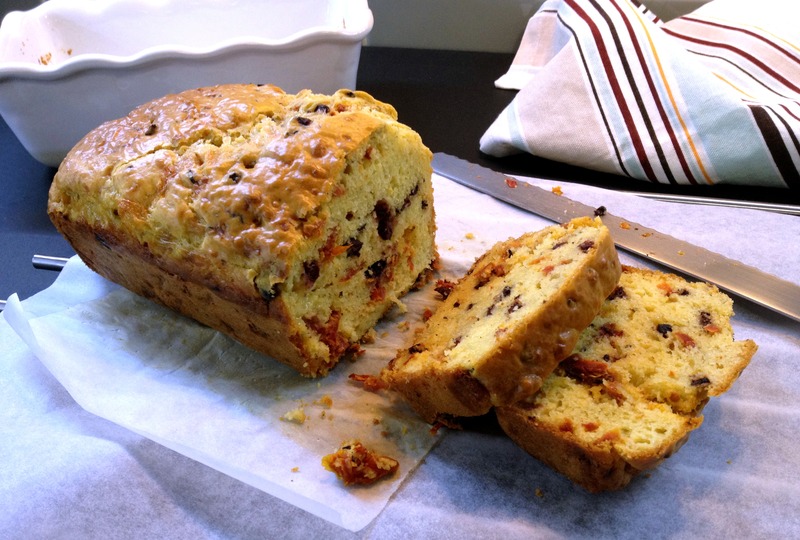 What a wonderful idea to bake the quick bread in this lovely dish! 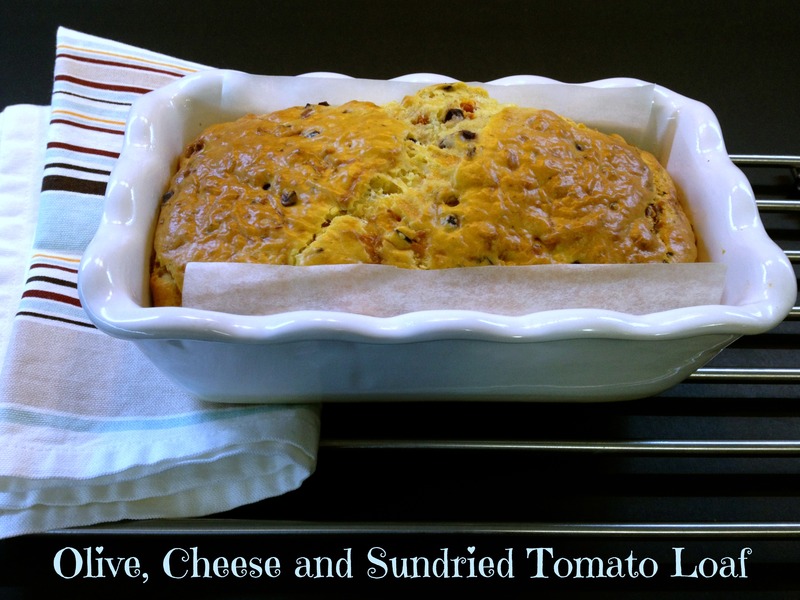 At first, I was really tmepted to add sundried tomatoes as well – they add such a nice flavor to baked goods – but in the end opted for different additions., a good recipe to play around with. I LOVE Williams Sonoma! I love walking around admiring all the beautiful things! Your pan is truly lovely. I think I need one. Sorry the bread wasn’t a bigger hit. At least you had your pan, though. the original recipe. Your bread turned out beautiful, and I love your new baking dish. Have a wonderful weekend. I would be a lot more prepared for my retirement had I never wandered into that very first Williams Sonoma. I liked this better the next day too. I’ve been toasting it. Lovely post! It really made me smile because I do the same thing! I buy something ordinary for some people by extraordinary for me that makes me smile and forget the mayhem around me! It is like meditating with a picture of lovely new kitchenware in my head!! Great bread and love the bread pan! Beautiful pan! I would love one like that. I liked the loaf slightly better than you did, but I think it could do with some adjustments. Less salt and oil, for starters. I love visiting grocery stores when I travel too! It’s so fun to see all of the different items that are available. I agree, this bread wasn’t anything special.